I was ready to post this new piece, Carl Sandburg’s “At A Window,” early yesterday when I had one of those days that come to challenge artists. Artists less fortunate than I can perhaps point to a single thing that holds them back, but with myself it’s often several smaller things. I’m a habitual early morning reader of the news, a rhythm that may have started in my earliest teens when I delivered newspapers before school and continued through night-shifts in hospitals where I’d read the papers as they came out in the predawn hours. Nowadays, it’s not the papers I turn to for news, but Internet newsfeeds, and the pre-dawn hour was filled with the reports of another mass shooting profaning music, this time in Las Vegas. These events hurt me because I often spend as spend as much of my day as I can carve out making the music here in combination with the words that I combine with it. One of art’s purposes in my mind is to allow us to set aside momentarily the real consequences and strictures of life. Not necessarily to escape them—in fact, many times art allows us to examine them so that we can treat them as the reality of what they really are, because those strictures, even things we fear most, have their limitations, just as we do. And art can be the “R&D Department” of the soul and the repair of the world. Thus, the hurt when those borders are crossed. Thus, the feelings of one’s work in an inadequate field. Of course, my feelings on this matter are a small and abstract hurt, compared to the suffering of those more directly impacted. Small things closer to my heart feel larger than great things farther away. This is one of the limitations of our perception. Then my day continued with another unrelated hurt, closer yet to my heart, and I was reminded again of my limitations and imperfections. Real hurt seems so large, art seems so small, and I feel like a poor worker in a field of playful trivia. Which may be so, the limits of my perception may not be able to tell. However, I believe this is a common feeling for artists to have, and so if you create art, you may also have felt this. We try to do so much, and all we can see is so little. This is part of why the Parlando Project principle: “Other People’s Stories” has value. Speaking the words of others helps me by adding what their eyes and hearts have seen. This morning, it turns out that Carl Sandburg, in the very piece I was working on this previous weekend, “At a Window,” was speaking to this experience, though in my down-heartedness, I couldn’t hear him for a while. This short poem, appearing first in 1914 in Poetry magazine alongside his “Chicago, hog butcher for the world…” poem which will overshadow it, waited patiently to speak into my ear. What good could a more than a 100-year-old poem have for me? 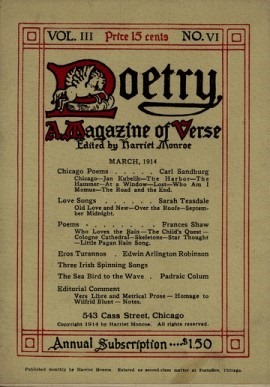 Eight poems of Sandburg’s Chicago Poems debuted in this issue. “At a Window” says that even in shame and failure you must hunger for even more of the same. 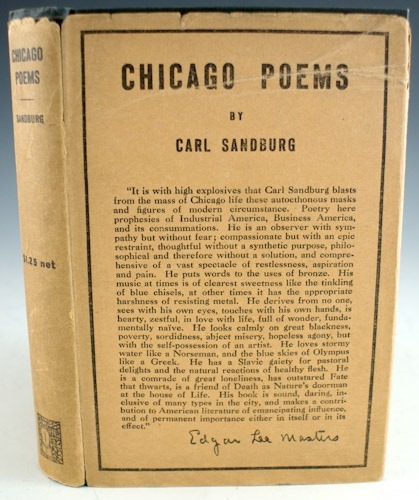 In the context of the sampling of Sandburg’s Chicago poems, which spoke so frankly about the situation of poor and working-class Americans, I think that window in the title means so many things. Yes, it means there is an imperative to look outside oneself as an artist. The dusk and shadows out the window lets one see little, but one must still look. Will there be any consolation? Sandburg apparently had such consolation in his spouse, who championed his work, who he speaks of in the “Leave me a little love…” section. Perhaps you have such a champion in your life, perhaps you don’t. We are called in “At a Window’s” conclusion to look out the window anyway. Perhaps the one who comes walking out of the dusk is yourself, to champion someone else? To hear the performance of Sandburg’s “At a Window” use the player below, and thank you for listening.